The following are thumbnails of Barron Park Artists' works. Click on the artwork of your choice to see the larger version. "Michael Juggles The Sun and Moon." -- Oil painting by Shirley Gaines. Shirley has been an artist since the age of three. She later studied painting with Gaylen Hansen at Washington State, and sculpture at the San Francisco Art Institute with Helen Phillips. She has since studied with various painters and printmakers in the Bay Area. Shirley lives in Barron Park with her husband Ed, a radiation physicist, their border-collie, Tillie, and two moggies. Erin Tajime Castelan: I paint with acrylic or chalk on canvas. I particularly enjoy working with chalk pastels because they are infinitely blendable. When I seal a chalk painting with varnish, the colors are permanently fixed and it looks very much like an oil painting. MUSIC: Leland Smith, Edith's husband, is a musical composer, performer, and teacher. He studied composition with Milhaud and with Sessions at the University of California at Berkeley (BA and MA), and also with Messiaen in Paris. He has taught at Mills College, the University of Chicago, and since 1958 at Stanford University, where he is professor emeritus of music. He was a co-founder of the Stanford Computer Music Facility (CCRMA). He has performed widely in symphony orchestras as a bassoonist and clarinetist. Ann Carlisle Beyer first came back into art via textiles, doing large scale painted works on fabric and some flags. Then, in 1990, she began working in oils with Earle Pierce, a student of Hans Hofmann, and recently joined Edith Smith's critique group here in Barron Park. "Now that my children are gone, I can concentrate more fully on painting animals and my dreams in my studio over the garage at home. The painting shown is "Lakeland Sheep #1," done on a recent trip to the Lake District in England." "In Our Minds' Eye We Are All Free To Roam." -- Acrylic by James Witt. He is a painter, sculptor, and general building contractor (see Website) who has lived in Barron Park most of his life. James can be contacted at (650) 494-2041. "Robert Gray" -- Oil painting by Adrienne Gillespie. "I painted this tug boat when she was in the port of Redwood City. I love oil painting and the outdoors, so my favorite subjects are landscapes and seascapes, whether open vistas or man-made structures. Because I enjoy the process of painting, I am never in a hurry to finish, and will return often to one location during bad weather. I work at home on still life paintings. My paintings are exhibited locally, including Stanford, and more recently collectors in the east have become interested in my work." Rona Foster creates functional and decorative pottery and ceramic jewelry in her Palo Alto studio. "I love experimenting with different designs, forms and textures. I like to use mostly bright colors on my pottery to express the aliveness I experience with the medium of clay." Rona teaches ceramics to children from age three on up at the Palo Alto Junior Museum, the Los Altos and Menlo Park Rec. Depts., and other locations. She also offers classes and workshops for adults and families. Call her at (650) 424-9329. Christine Heegaard is a mosaic artist since 1997. She studied this medium in Ravenna/Italy with Notturni. She teaches Mosaic Art in her Barron Park home studio. She makes furniture, sculptures, garden decorations, wall-hangings and accessories. She also takes commissions and loves challenges! She exhibits in galleries and public places, and also opens her studio to the public twice a year. 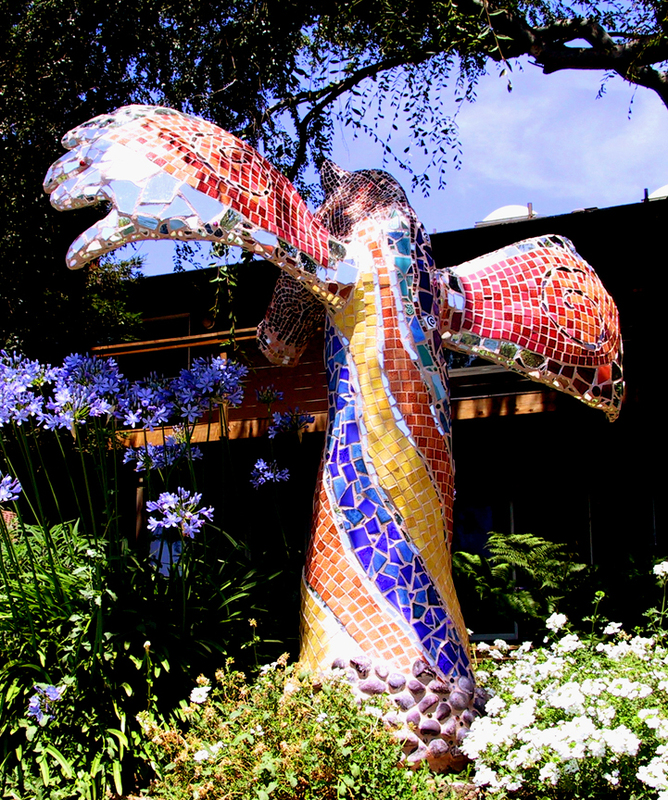 She has an eight feet high mosaic tree: "Lives", in her front yard (3680 la Calle Court) for everyone to enjoy! Gary Breitbard Music -- accordion, fiddle, banjo -- French, Italian, Oktoberfest and American music for parties, schools, receptions. Lessons on piano, accordion, fiddle, banjo, guitar. 650-493-0693, gary at gybmusic dot com. Pat Burnham and David Gilbert moved to Barron Park in 1990. David is a violist with the San Jose and Oakland Symphonies. Pat is a "free-lance" violinist, performing often with the San Jose Symphony. She teaches at the San Francisco Conservatory of Music and at her home in Barron park. She currently has abut 35 students. Most of all she and David love to play in string quartets together for weddings and parties, etc.